(ZIZ News) — Consultants from the U.S. navy have returned to St. Kitts to begin hydrographic surveys throughout St. Kitts and Nevis. Members of the St. Kitts Nevis Defence Force Coast Guards, officers from the CDA Technical Institute, commonly known as the Commercial Diving School, the local team from the Department of Maritime Affairs along with personnel from the St. Christopher Air and Sea Port Authority (SCASPA) gathered on the runway on Tuesday to witness the unloading of the hydrographer’s surveying equipment. The equipment was transported to the island via a United States Navy C- 130T cargo plane. Director of Maritime Affairs, McClean Hobson, explained that the hydrography surveys were critical to St. Kitts- Nevis, as the updated documentation is crucial for the safety of navigations. “This is as a result of a request which was made by the Department of Maritime Affairs back in 2012 for the Hydrographic survey of these ports so that the charts can be updated for the Safety of Navigations. Lead Hydrographer responsible for the St. Kitts Nevis Survey, Forrest Noll spoke with ZIZ news about the work his team will be doing on both islands and stated the purpose for the surveys. “The main purpose of this survey is to collect data, depths, ace navigation, and lights, everything that is required to update a nautical chart. Charts are normally old, depths change whenever weather comes through and most of the charts you have right now are 10 to 20 years old so they need to be updates”, Noll stated. He also explained that the hydrographic surveys will help to make the process of trade and business on our coastlines easier, cost efficient and safer. “If the charts are out of date, all the costs of the goods go up because prices go up and they have to charge more to bring goods in because insurance goes up and it will cost more for ships that are coming in. Also if an accident happens and there are old charts and a wreck happens etc, insurance goes up even higher because people would not want to come in if they don’t know if the waters are safe”, the Lead Hydrographer explained. 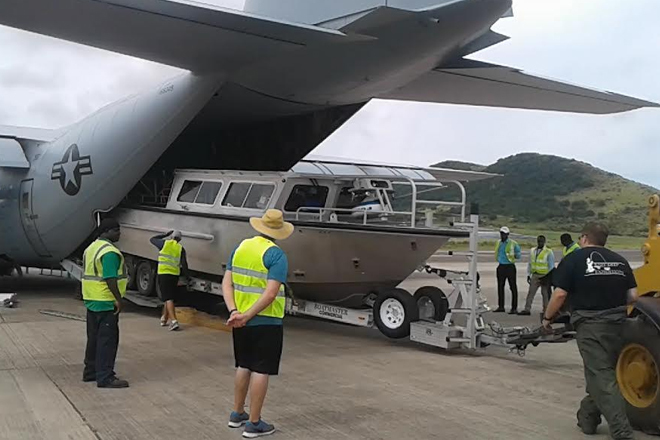 During the unloading process, a rare sighting of a U.S Navy vessel being transported from the aircraft caught the attention of many bystanders. The vessel was then relocated to the SKNDF Coast Guards vicinity. ZIZ understands that the vessel will be used to conduct the surveys. The team will be mapping the ocean floor near ports of Basseterre, Charlestown and Long Point, Nevis. The team of 7 hydrographers will also be taking high resolution photographs to show what lies beneath the surface. The Hydrographic Surveying begins on Wednesday October 19 and is expected to conclude by the ending of November.